30 Second Wine Advisor: Wine books: What did Noah drink? Holiday Shopping Making You Crazy? Easy Ordering! Click Here or call 1-800-777-4443 and use Promo Code: 2DAYAIR when placing your orders. Wine books: What did Noah drink? I'm sure I've said this before, but one of the things I like most about wine is that it brings pleasure not only to the senses but to the intellect as well. Although similar arguments could perhaps be made for beer, tea and coffee, I'd assert that wine boasts a cultural, historical and even religious heritage that few other beverages can match. Wine is a drink that makes us think. It's no surprise, then, that wine has inspired shelves, even libraries full of books, tomes that range from tasting tutorials to wine-buying guides and that run the gamut from grape-growing to wine-making to marketing the stuff. I've seen books of wine quotes, wine fiction, wine poetry. Oversize atlases are filled with colorful wine maps, and wine encyclopedias large and small cover the subject, literally, from A for Abbocato to Z for Zymase. I love to read about all manner of history, from historical fiction to scholarly treatises on life in the ancient Near East, so just about any good book on wine history will get my attention. So I guess it goes without saying that I was excited to discover (in Patrick Comiskey's "Serious Drinking" column on "Old Wine, New Books" in a recent edition of LA Weekly) about a brand-new book on the history of ancient wine. Quick as a mouse-click, I purchased it in hardcover and skimmed it for a quick review. I look forward to digesting it more at leisure. Meanwhile, though, I wanted to let you know about it this week while there's still time to order books online for holiday giving. In Divine Vintage: Following the Wine Trail from Genesis to the Modern Age, Master of Wine Joel Butler and bible scholar Randall Heskett explore the influence of wine on human society since the dawn of civilization, examining both the historical record and the arc of Western philosophy as reflected in their reading of biblical texts and other ancient writings about wine. This is not a religious book but a cultural examination of how wine has figured in history and how bible stories from Noah's vineyard to Jesus' changing water into wine reflected the evolution of human understanding of wine and spirituality. "We assert ... that one role of wine in the biblical traditions serves metaphorically for the spread of human (certainly Western) civilization," the authors write, pointing out that the birthplace of wine and its source in the Fertile Crescent mirrors the rise of civilization and the evolution of the books that became the bible. "On another level, wine represents the most profound and revealing connection between humans and their need for 'connectedness' to something we call the 'divine.' By its use, new visions and understandings become 'realized' from an entirely new perspective." The first six chapters examine wine as presented in bible verses and other ancient texts in the context of modern understanding of climate, wine making, history and archaeology. The second half of the book turns to the authors' wine travels through the countries described in the Bible and other texts of the Ancient Near East: Israel, Jordan, Egypt, Lebanon, Turkey and Greece, discovering what the wines of those regions are like today and estimating what the wines of ancient times might have been like. It's a fascinating book for any wine lover, history buff or spiritually inclined person, and you don't have to be a seminarian or church-goer to enjoy it. It's highly accessible and of interest to anyone who seeks a literate romp through the history of ancient wine. If you'd like to order Divine Vintage: Following the Wine Trail from Genesis to the Modern Age for your own enjoyment or for holiday giving, you can click here to order it now from Amazon.com for $16.20, a $10.80 saving from its $27 list price. The Kindle edition is available at the same link for $12.99. Finally, if you're looking for the ultimate wine-book gift for the wine lover who has everything, and price is not an object, you might want to consider the new Wine Grapes: A Complete Guide to 1,368 Vine Varieties, Including Their Origins and Flavours, by Jancis Robinson, Julia Harding and Jose Vouillamoz. No stocking-stuffer, its 1,280 pages tip the scales at nearly seven pounds, but it's chockablock with detailed, scholarly information about every known wine-grape variety. Says Amazon.com: "Where do wine grapes come from and how are grape varieties related to one another? What is the historical background of each one? Where are they grown? What sort of wines do they make? "Using cutting-edge DNA analysis and detailing almost 1,400 distinct grape varieties, as well as myriad correct (and incorrect) synonyms, this book examines grapes and wine as never before. Here is a complete, alphabetically presented profile of all grape varieties of relevance to the wine lover, charting the relationships between them and including unique and astounding family trees, their characteristics in the vineyard, and--most important--what the wines made from them taste like." This doorstop of a wine-reference book goes for a cool $175 at book stores, but if you've just got to have it, Amazon.com will knock off 37 percent, cutting the toll down to "only" $110.25, a saving of $64.75. If you've just got to have it, why resist? Click here to order it now. If you purchase any of the wine books linked throughout today's edition, we'll receive a tiny commission from Amazon.com for each book sold. Tiny commissions do add up and help us pay the rent, and for that I am grateful. All the best of the holiday season to you all, and to your families, loved ones and friends. It's easy to send thoughtful gifts featuring handcrafted wines from California's small "mom & pop" wineries. *	Every wine has a story, and they share these stories in their Uncorked® magazine along with wine tips, recipes and insight into California's wine scene. *	The opportunity to reorder favorite wines at savings of up to 50%. *	Bonus Gifts: A handy two-bottle wine tote and a $25 Wine Credit. Gifts start at $49.95, including shipping and handling. Tax extra where applicable. Hurry! Offer ends Midnight (PST), December 18, 2012. FOOD MATCH: Characteristic of simple Bourgogne Pinot Noir, it's a versatile table wine, fine with beef or lamb, roast or grilled poultry, full-flavored cheeses, mushrooms and even fresh wild salmon. It worked very well with an autumn meal of roasted vegetables and sausage. WHEN TO DRINK: Good now and meant to be enjoyed while it's fresh. In contrast with more pricey Burgundy, it's not really intended for aging. VALUE: My local price is reasonably in line with the $16 median price reported for U.S. vendors on Wine-Searcher.com. In the current market, it's a good value for a decent, well-balanced Bourgogne Pinot Noir. On the U.S. importer's website, this page offers a sound clip of producer Laurent Drouhin pronouncing the name of the wine. Here's an English-language fact sheet on Drouhin's "Laforet" Bourgogne Pinot Noir. 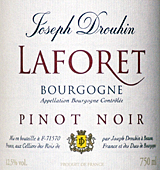 Compare prices and find vendors for Joseph Drouhin 2010 "Laforet" Bourgogne Pinot Moir on Wine-Searcher.com.